Without an atmosphere, the Earth would be a rocky planet with no oceans, clouds or life. The mix of gases and conditions in the Earth's atmosphere make life possible. Plants and animals need the gases in the air to survive, and the protection the atmosphere provides helps sustain life as well. The atmosphere blocks out harmful rays from the sun. The ozone layer, which lies in the stratosphere 11 to 50 kilometers from the Earth's surface, blocks out many harmful forms of radiation. Without the ozone layer, ultraviolet rays would destroy most life on Earth. Gases in the atmosphere also hold in heat. The Earth's average temperatures would fall below the freezing point of water without atmospheric gases to hold enough heat. The balance between blocked radiation and radiation allowed to reach the Earth makes life possible. 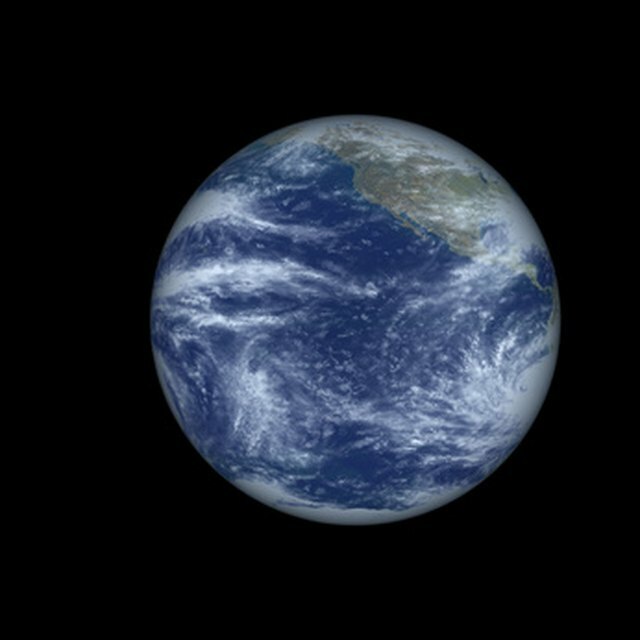 The Earth's atmosphere contains water. As water evaporates or is given off by living organisms (respiration in animals, transpiration in plants), it rises through the atmosphere and forms clouds. Wind moves the clouds over the surface of the planet. When the clouds condense into rain, snow or other forms of precipitation, the water falls on the surface of the Earth. In this way, the atmosphere regulates the balance of water on Earth and delivers precipitation to areas that otherwise would not have water. Life on Earth needs the atmosphere to breath. Animals take in breathable oxygen from the atmosphere and use it to metabolize food into energy. Plants use carbon dioxide to grow and sustain life. The balance between these two gases is important as well: animals need enough oxygen to breathe and plants need carbon dioxide, but too much carbon dioxide traps heat in the atmosphere, leading to global warming. The atmosphere contains a large amount of nitrogen. Some plants take nitrogen straight from the air and use it to build nutrients needed for growth. Atmospheric wind erodes land so it can be broken down to form life-sustaining soil. Rice University: Why Do We Care About the Atmosphere? Linkenhoker, Eric. "Three Ways That the Atmosphere Helps Living Things Survive on Earth." Sciencing, https://sciencing.com/three-living-things-survive-earth-8632405.html. 23 April 2018.